Walmart has discounted Apple’s AirPods by $40 to $179, which is the lowest price we’ve seen for the iPhone maker’s magical wireless earbuds. AirPods are powered by Apple’s W1 chip, which allows for easy pairing to all your devices through iCloud, plus it also has fast charging. If you have an iPhone 7 or newer–without a headphone jack–AirPods are essential so you can charge and listen to audio wirelessly. 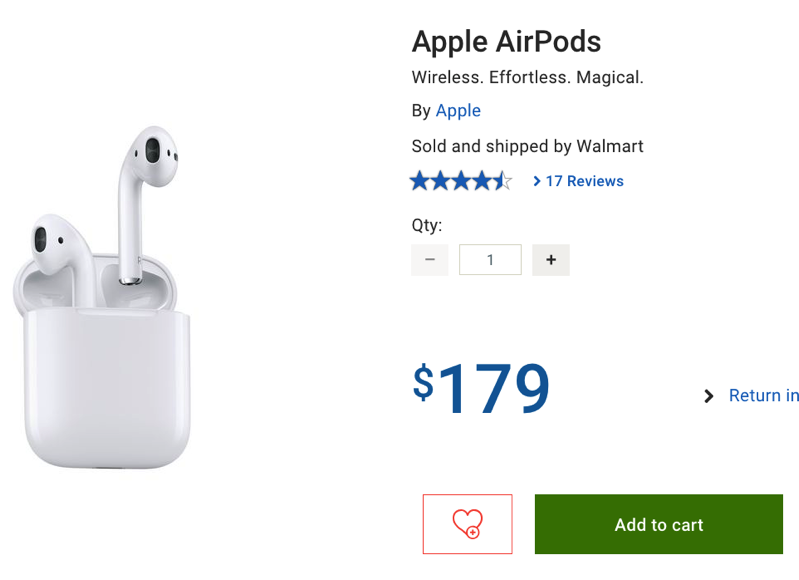 With this 18% discount on AirPods at Walmart, plus Apple’s recent price reduction on BeatsX, one would think new models are coming out soon—possibly at an upcoming October event? Anyways, if you were waiting to buy AirPods, this is a great price and you could even save a few extra bucks by price matching at Best Buy.